These really are a stunning keepsake to treasure forever! A 3D life casting will provide a lasting memory, capturing all the details of how small your little ones hands and feet once were. Free-Standing: £55 for 1 cast, £75 for 2 casts (e.g 2 hands, 2 feet or 1 hand and 1 foot), £115 for 4 casts. On an open display plinth: £65 for 1 cast, £85 for 2 casts (e.g 2 hands, 2 feet or 1 hand and 1 foot), £125 for 4 casts. Framed: £80 for 1 cast, £110 for 2 casts, £170 for 4 casts. (Frames range from 8″ x 8″ to 10″ x 8″). 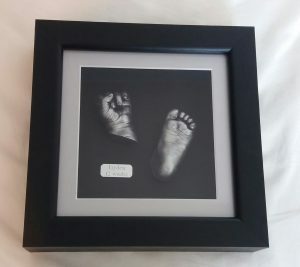 Triple-front frames, measuring 16″ x 10″, allowing for a photo in the middle with casts either side (suitable for 1 child or siblings) are £145 for 2 casts or £195 for 4 casts. The frames are Luxury Hardwood Box Frames, available in various finishes – Black, White, Silver, Oak, Chocolate or Natural. Front and back mounts are available in various colours – White, Cream, Grey, Black, Coffee, Pink or Blue. 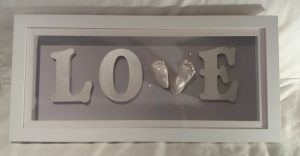 The 2-feet ‘Love’ Framed Cast is £160 and comes in a 26″ x 11″ frame (with a pine back box) in various finishes – Black, White, Chocolate or Oak. 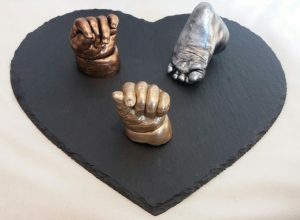 Hand-holding castings, on a display plinth are £160 for an adult and child, £180 for 2 adults and £220 for a family of 2 adults and up to 3 children. Prices are applicable for children up to 6 months of age and 5cm deep frames. Larger castings requiring bigger frames can be quoted for. Prices include a home visit for the casts, covering the South-East of Kent, inbetween Sandwich, Folkestone and Canterbury. Please click here to read more on how the 3D life casts are taken. Please contact me to order a 3D life casting and arrange an appointment to take the casts.